Life can sometimes get in the way, interrupting your usual schedule and leaving little time for proper cleaning of your home or business. Contact the professionals at Sears Maid Services. Whether you need a one time, top-to-bottom cleaning for a special event, or prefer a regularly scheduled cleaning, we can get the job done, and within your budget. Our team of experienced cleaners can handle all of your residential and commercial needs. Give us a call at (631) 524-5000. Sears Maid Services is the name to remember when it comes to cleaning your apartment or home. 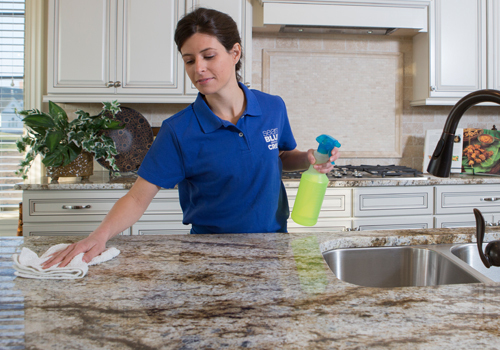 Our staff can handle a multitude of tasks from dusting and sanitizing surfaces to cleaning the oven, bathroom, and vacuuming. We work around your busy schedule, offering cleanings weekly, biweekly, or monthly, and are also available for a thorough Deep Cleaning service, which includes normal cleaning services with extra attention paid to troublesome areas. Whether it's for spring cleaning or something more steady, contact us at Sears Maid Services, and we will have your home sparkling in no time. Your office's condition reflects on you and your staff and makes an impression for your clients. Show your clientele that you care by keeping up your office's appearance and contact our professional cleaning staff at Sears Maid Services. We handle various tasks such as taking care of those unsightly stains, emptying waste baskets and tidying up your bathrooms and kitchens. Contact us today for a full list of services. New homes, or even renovations, can be exciting but leave behind a mess to clean. Sears Maid Services aren't afraid of a mess and are the experts to call when it comes to disposing of construction trash and cleaning up a newly constructed space. We will rid your home or business of leftover debris and mop, sweep, and dust. Our professionals will also sanitize and wash all surfaces, leaving you with the task of enjoying your renovated surroundings. Call us today and see what we can do for you. We know how difficult it can be choosing the right cleaning company to let into your home or business. You need to trust the individuals that will be providing this service will get the job done right the first time and to your satisfaction. That's why our employees at Sears Maid Services go through a rigorous screening during the hiring process, including a thorough background check, and on-site and off-site training to ensure we develop the best staff in the industry. We also offer a guarantee that you will be satisfied by our services. If you're unsatisfied with our work, simply call us within 24 hours, and we will send one of our technicians to your site for a thorough inspection. If we find the work was not completed properly, we will fix our mistakes at no additional cost to you.